The United States Merchant Marine is a proud branch of service that is often overlooked. In peacetime its ships carry cargo and passengers, and in war they act as a reserve for the US Navy. 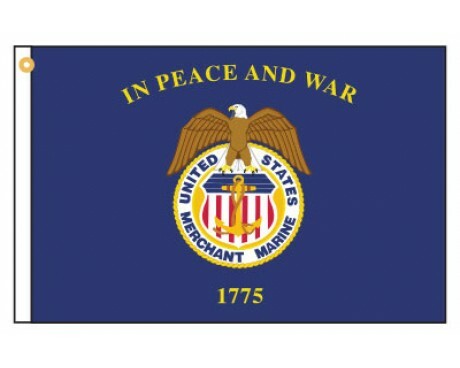 A Merchant Marine flag from Gettysburg Flag Works is the perfect gift for any veteran of this service. After the news of the battles of Lexington and Concord spread around Massachusetts, a group of citizens took it upon themselves to capture the HMS Margaretta, a British schooner. The British told these men to bring lumber to Boston to help build barracks for the King's soldiers, but they refused the order and chose to fight instead. The Continental Congress issued Letters of Marque to that crew and many other privateers throughout the course of the war to disrupt British shipping. This was the start of the US Merchant Marine. The Merchant Marine has played a role in every significant conflict since. During World War II, the Merchant Marines suffered the highest casualty rate of any service in the United States military. The Merchant Marine participated in the Incheon landings during the Korean War, as well as carrying supplies to American forces during the Vietnam War. In the modern day, the Merchant Marine participated in Operation Enduring Freedom, Operation Iraqi Freedom, and provided humanitarian aid after Hurricane Katrina made landfall in 2005. 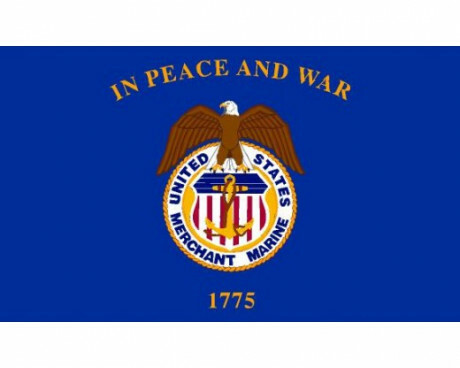 Buy a Merchant Marine Flag Today! A Merchant Marine flag from Gettysburg Flag Works is going to be of the highest quality since they are made right here in the USA. We have options for both indoor and outdoor display, to fit whatever your need may be. 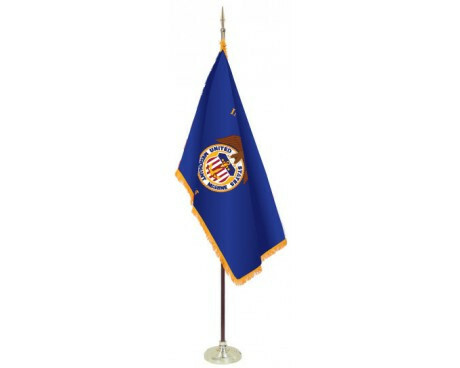 Our Merchant Marine flags are made of a colorful nylon fabric that will resist fading in the sun. 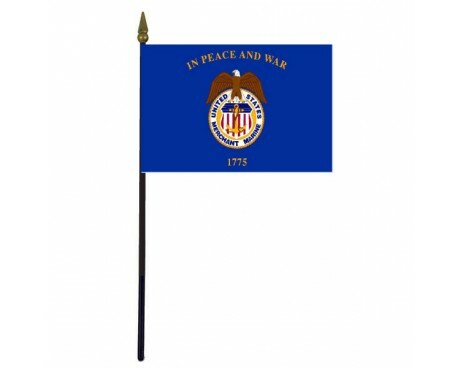 The beautiful colors on the flag will look great inside on our indoor display sets. 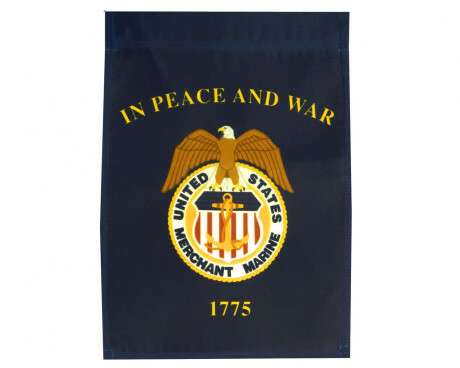 Celebrate the Merchant Marine by displaying one of their flags! Place your order today! Have questions about our products? Give us a call at 1-888-697-3524 or contact us online and we'll be happy to assist you. 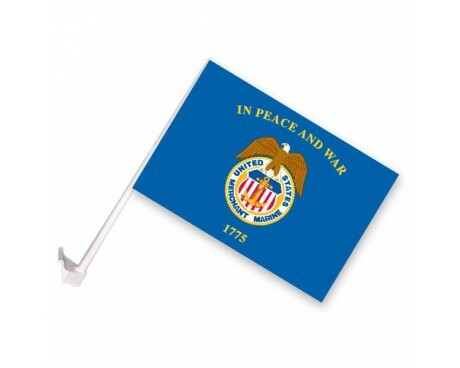 If you're planning on buying a Merchant Marine flag, you may want to consider buying an American flag as well to complete the display. Many customers who bought Merchant Marine flags were also interested in military medallions.